The Trash Music piece follows my interests in ecology and environment. Since autumn 2016, I have been discovering how to play the trash and learning about its music. Fascinated by the objects of everyday use and their sonorities, I gathered a set of sound sources while reusing materials such as cans, polystyrene, different kinds of paper, used tape and aluminum foil, plastic boxes, pins and rubber bands. Some of these objects, I rebuilt into new instruments and played them along my accordion, harmonica, hichiriki and voice, creating a dialog and bringing the trash aesthetics into my background of classical accordionist. 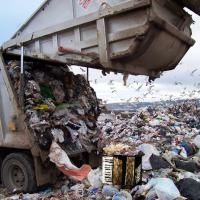 The music of trash is unfortunately spreading around with general wasting of materials. The Trash Music piece is a reminder to reuse and recycle so we don´t cover the voice of the Earth completely. Interview with Lucie Vítkovà by Knut Remond. Limited edition audio cassette, 8 copies numbered. Available at 'ohrenhoch, der Geräuschladen' (and heard on headphone in the ohrenhoch archive). I am a composer, improviser and performer (accordion, harmonica, voice and tap dance) from the Czech Republic. During my studies of composition at Janáček Academy of Music and Performing Arts in Brno (CZ), I have been a visiting scholar at Royal Conservatory in The Hague (NL), California Institute of the Arts in Valencia (USA), Universität der Künste in Berlin (D) and recently at Columbia University in New York with Prof. George E. Lewis. My compositions focus on sonification (compositions based on abstract models derived from physical objects), while in my improvisation practice I explore characteristics of discrete spaces through the interaction between sound and movement. In my recent work, I am interested in the musical legacy of Morse Code and the social-political aspects of music in relation to everyday life. In Berlin, I have organized Temporary Ensemble and Experimental Music Orchestra of UdK. Along my studies in New York, I have been nominated on 2017 Herb Alpert Awards in Arts in category of Music and I have put together two ensembles – NYC Constellation Ensemble (focused on musical behavior) and newly OPERA ensemble (for singing instrumentalists).